I'm back in England right now and didn't manage to raise myself at 4am to watch this one unfold, but my eyebrow did just shoot up when I noticed Nagasawa started ahead of Johnsen. I don't know the full story here, but why, in a game of this magnitude, we'd play a young rookie ahead of any of our better and more experienced strikers is absolutely beyond me. He got subbed at half time for Frode. 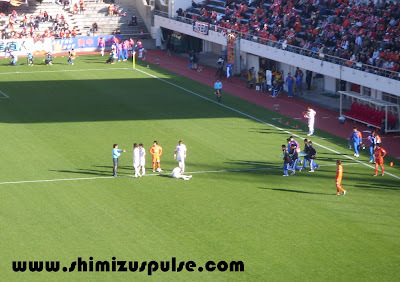 It took extra time and penalties to decide this one, with Ichikawa's shoot out miss proving the difference. He beat the keeper, but not the crossbar. The meaningless lottery of the penalty shootout was played out with noone else missing, which meant Nagoya won 5-3 on spot kicks. Another cup semi final loss isn't exactly a joy to behold, but that's football, and all things considered we've had a better season than many. Gamba Osaka will be Nagoya's opponents in the final on Friday, and it's hard to look beyond the Osaka outfit adding to their impressive six-trophy trophy haul in recent years. 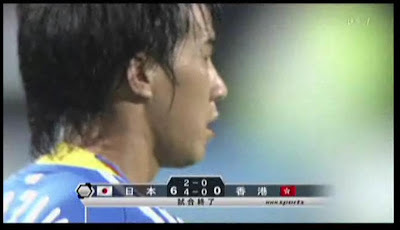 If Osaka do defend the title they won on Jan 1st 2009, Hiroshima will receive the fourth ACL spot for next year. For that reason alone I'm kind if hoping Gamba win this one! Here are some extended highlights of the game. There's no replays on any of the goals or for the penalty decision (which looks like the Nagoya player just falls over into Arata), so if I can find a better set of highlights I'll add them. It was officially announced today that S-Pulse had secured the services of relegated JEF United's Eddy Bosnar for the 2010 season. The 6 foot 4 inch centre back will help fill the void created by Aoyama's continued absence through injury. The big man's arrival will help shore up the one main area we were lacking in this year. 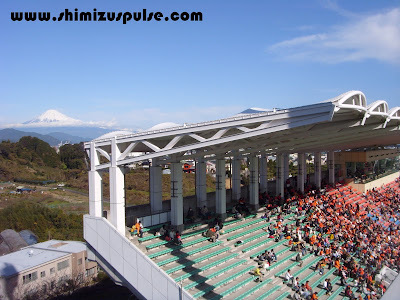 S-Pulse marched on to the semi final of the cup in a pulsating match at a sun-bathed Nihondaira this afternoon. 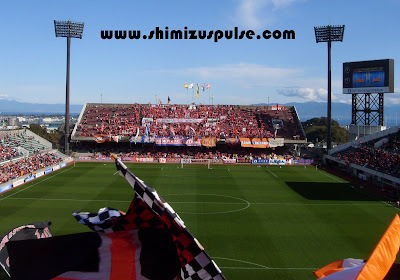 An excellent away support came down from Niigata for what would be the final game of 2009 for one of these two teams. S-Pulse rediscovered the art of goal scoring with both front men getting on the score sheet, but it was Arata Kodama who popped up deep in extra time first half stoppage time to volley home the goal which sent us into the cup semi final. The semi final will be played at Ecopa Stadium on December 29th at 1pm. Opponents will be Nagoya, who beat Gifu in their quarter final. All three videos courtesy of YouTube user ssnnddttyy. More good news to top off an excellent year for Shinji Okazaki; he was this evening named as one of the two best strikers in the country at the annual J. League awards. The recognition comes at the end of his first full season as a starting member, and after netting 14 league goals. Including four league cup goals, he's at 18, with the remainder of the Emperor's Cup still to play. He's worked his way into the national team this year and is all set to head to South Africa next summer. In the J. League best eleven for 2009, Okazaki is partnered up front by Jubilo forward, and league top scorer with 20 goals, Maeda. It's fitting to see Shizuoka leading the charge for the best 11 this year, but it's high time the orange machine claimed another title or two to ensure people don't forget where the heart of football lies in Japan! For full details on the 2009 J. League awards, click here (in Japanese). For the official S-Pulse report, click here. In Japanese, but with plenty of pictures. We also reprised last year's achievement of winning the award for the best pitch in the league. The people in charge always keep Nihondaira's surface in near perfect condition, so it's great to see their efforts rewarded for a second season running. The award this year was actually split three ways, with Urawa and Omiya's Saitama Stadium and Albirex Niigata's Big Swan also being rewarded.